The audit report was published on 25 January 2019. The period under review was 21 months, from April 2016 to December 2017. This audit aimed specifically to assess the effectiveness of program management and supervision mechanisms, financial management and controls in place over grant funds, and supply chain mechanisms in providing medicines to patients. The report said that over 60% of total grant expenditures, including local procurements, were reviewed, due to “high financial risks” identified in the OIG’s initial risk assessment performed before the fieldwork stage of the audit. The OIG team visited 18 health facilities, stores and health administration offices as part of the fieldwork for the audit. The OIG report commended Madagascar’s progress against the three diseases, improved financial controls and assurance mechanisms to safeguard grant funds, and support for supply chain mechanisms. Impact against the diseases included that the number of deaths in Madagascar due to malaria fell by 33% between 2013 and 2016, the number of people living with HIV on treatment increased more than three-fold between 2014 and 2017 (from 750 to 2,321), and the treatment success rate for TB was 86% (exceeding a program target of 85%). Financial risks have been substantially mitigated by various measures put in place by the Global Fund, including financial safeguards, a Fiscal Agent reviewing and clearing expenditures by the Ministry of health and its sub-recipients, a Local Fund agent, the transition of HIV commodities procurement to the Global Fund’s Pooled Procurement Mechanism, and accounting software introduced at sub-national levels. The audit found no fraud or material irregularities – an important finding given the OIG’s initial risk assessment. The report identified the “key issues” for Madagascar of low quality of and access to services for malaria, low HIV detection and treatment, and deficiencies in data and staff capacity as the key issues and risks in Madagascar’s Global Fund-supported grants. 4.1 Progress has been made on programmatic results but significant challenges exist in access to and quality of malaria services. In 2016, 1.5 million were tested for suspected malaria cases, a two-fold increase since 2010, and more than 11.8 million bed nets were distributed, from 2014 to 2016. However, an ongoing major issue for the country, where 14 out of 25 million people live in rural areas, is providing services in hard-to-reach areas. Other points made by the OIG within this ‘hard to reach’ issue were low service coverage (especially of children aged 6 to 15, who make up 40% of malaria cases but are excluded from care), lack of data on malaria care at community level, limited capacity of community health workers, and accessibility challenges due to long distances as well as the lack of travel allowances for health workers. Another serious issue is drug and rapid-malaria-test stockouts at primary health centers, caused by supply chain problems as a result of inaccurate quantification of commodities and procurement planning, as well as non-compliance with national malaria treatment guidelines. 4.2 HIV detection and treatment levels are significantly lower than the estimated prevalence would suggest. The OIG says this could be due to low detection among key populations (where estimated prevalence is 6.2% compared to 0.2% in the general population), which is in turn due to low outreach and coverage, a weak testing strategy, severe deficiencies in training of medical staff on HIV and testing requirements, as well as a need for updated prevalence estimates. 4.3 Data deficiencies and staff capacity challenges adversely affect quantification and other critical decisions. Low reporting by facilities and no reporting by communities, with significant inaccuracies in data that do get reported, has negatively affected the measurement of program results. For malaria, drugs consumption is reported for only 39% of drugs distributed. For HIV, drugs consumption data are available but by the end of December 2017, only two thirds (64%) of health facilities had submitted patient data reports for that year. For survival rates of PLHIV under treatment, only 31% of HIV treatment centers had provided the required data. The OIG said that the data issues contribute to a gap between the assumptions used for quantifying and distributing drugs, and the actual results. Further, a root cause of data inaccuracies was ineffective supervision of health facilities, with only 26% of a planned 224 supervision visits from regional level to district level taking place. National programs and Principal Recipients have severe procurement planning problems. Examples given by the OIG included poor anticipation of procurement timeframes for HIV drugs, leading to orders being placed and delivered late (received in July for 2016 and in September for 2017); seven out of 12 antiretroviral drugs experiencing stockouts at the central level between April and December 2017; and MDR-TB drugs that were delivered in July 2017 were stuck in port for more than six months due to delayed drug registration. 4.4 Grant-level controls have prevented material financial irregularities, but systemic improvements are needed to enhance grant absorption and results. The OIG found that the various measures put in place by the Global Fund (Fiscal Agent, LFA, among others) have resulted in mitigation of risk for irregular expenditures, but there are still gaps in implementers’ ability “to fully utilize funds to deliver program impact”. Erroneous or irregular transactions not detected in a timely manner by the Principal Recipient’s internal control mechanisms were rejected by the external controls in place (e.g: Fiscal agent, LFA) upon review. That contributed to procurement delays as well as to delays in executing some “high-value” financial transactions, and consequently have contributed to low grant absorption. Objective 3: Financial management and controls in place over grant funds, “partially effective”. The Global Fund’s current grants to Madagascar, totaling $82,741,299, comprise two HIV grants, two malaria grants (which also support health system-strengthening activities), and one tuberculosis grant. The HIV and malaria programs have dual government and non-government implementers, with the TB programme led by one governmental PR. Programme implementation involves 21 sub-recipients. Madagascar is classified as a low-income country. It is ranked 158 out of 188 countries in the Human Development Index Report, and 155 out of 180 countries in Transparency International’s Corruption Perception Index. The weakness of the country’s health system is aggravated by 60% of the country being hard to access due to uneven terrain, limited road infrastructure, and a long rainy season. The health workforce is limited, and the 60% of the population that lives more than 5km from the nearest primary health center therefore relies mainly on health services at the community level. Since 2004, the Global Fund has signed grant agreements for more than $403 million and disbursed $356 million to Madagascar, which is considered a ‘core’ country (larger portfolios, higher disease burden, higher risk). In 2016-2017, Global Fund financing supported 94% of the country’s HIV program, 69% of the TB program, and 60% of its malaria program. AMA 1: Develop a costed plan for extending malaria case management at community level to children over 5, and improve data collection tools at community level (target date 31 December 2019). AMA 2: Develop a protocol and costed work plan to conduct an HIV prevalence survey (target date 31 December 2019). AMA 3: Strengthen data and inventory management across the three disease programs (target date 30 June 2020). All AMA’s are ‘owned’ by the Head of Grant Management (see page 19 of the audit report for more detail). 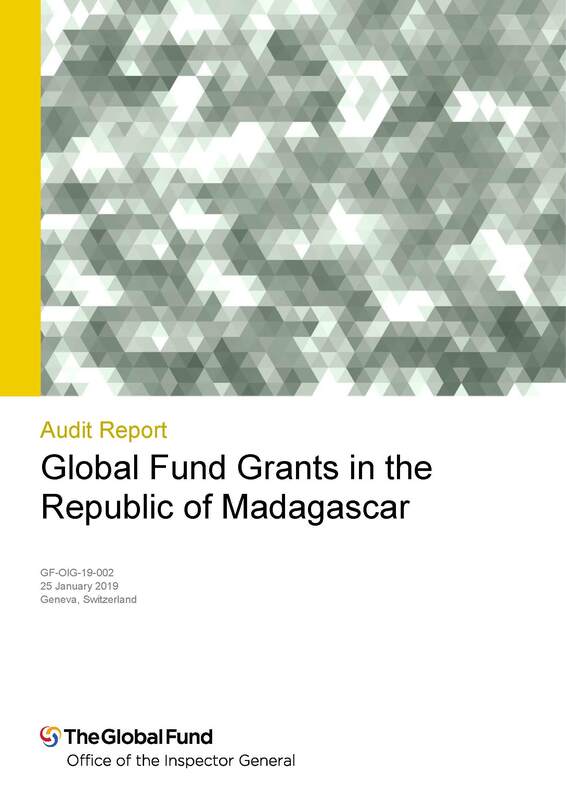 The first OIG audit of Global Fund grants to Madagascar was published in October 2011, and focused on grants managed by Principal Recipient Population Services International Madagascar. This audit identified issues including $215,066 in ineligible expenditure, 143,738 missing long-lasting insecticidal nets, and expired drugs. In 2014, the OIG published its report on an investigation into procurement activities at four Principal Recipients of the Global Fund’s National Strategy Application grant for malaria, covering transactions from 2009 to 2012. The investigation found non-compliant expenditure estimated at $1.16 million, as well as excess costs of $462,670 as a result of items bought at above-market prices. As a result, three of the PRs were not selected for the subsequent grants, and the Madagascar Country Team appointed a Fiscal Agent in 2016. As set out in Finding 4.4 (above), the OIG found that these measures have “significantly improved” financial controls.